A review of Capitalist Transformation and the Evolution of Civil Society in a South Indian Fishery, by Aparna Sundar. 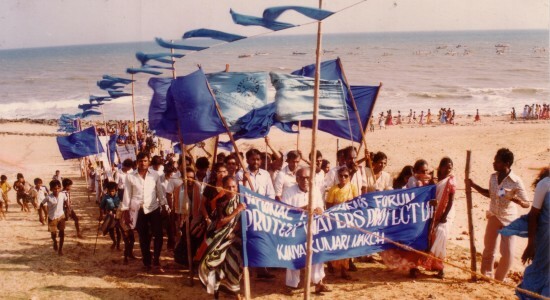 Aparna Sundar’s Capitalist Transformations and the Evolution of Civil Society in a South Indian Fishery represents a valuable addition to the growing body of social sciences research on fisheries, contributing a nuanced reading of the political economy of coastal Kanyakumari. Sundar makes it clear early in Chapter 1 that her research is rooted in Karl Polanyi’s seminal The Great Transformation (Boston: Beacon Press, 1957) in which he describes the “double movement” of expanding markets to dis-embed markets from social regulation and the counter-movement to re-embed them within the indigenous moral economy. She problematizes his limiting definition of “society” that fails to give any indication of how subaltern communities might respond to capitalist markets, e.g. “how different groups or sectors or classes are affected, the kinds of alliances that may be formed, and therefore which groups might be the agents of [a counter-movement against market expansions]” (p. 3). Sundar makes a second, important move in the introductory chapter challenging Partha Chatterjee’s influential assertion that the concept of civil society cannot be applied to the non-Western world, and that subaltern groups in places like India act instead through an identity-based “political society” (The Politics of the Governed: Reflections on Popular Politics in Most of the World. New York: Columbia University Press, 2004). Sundar’s argument throughout is, instead, that “[t]o think of subalterns as acting only within a political society…is to fail to observe the deep-reaching impact of India’s liberal-democratic constitutional framework” (p. 30-31). Chapter 2 is an ethnographic description of the villages under study. She begins by describing the political economy of “traditional” villages in the district – a qualifier that she does not accept without reservation but uses as short-hand to paint an image of how artisanal fishers think of themselves. She goes on to recount the historical development of the fisheries in Kanyakumari, tracing both its entry into global markets and the internal development trajectory from artisanal to mechanized fishing and the effects both of these had on wealth production in the district. Sundar concludes that variations in fishing practices and technologies at the village level underscore the continued importance of place and place-located communities in determining the nature of market participation. As becomes clear in later chapters, where the costs of market transformation are borne unequally, and the benefits shared so, the maintenance of community-based moral economies focusing on the commons become a key feature organizing the alliances of civil society. Chapter 3 teases out the organization of the various groups and alliances that make up Kanyakumari’s subaltern civil society. While Sundar notes that much of its associational and communicative content is state-generated, various groups that are thereby formed nevertheless remake their alliances in ways that better serve their needs and interests, often bringing them into conflict with established hierarchies of governance. In her description of local party politics and the fishers’ engagement with them, Sundar demonstrates that rather than standing as some distant object the state is deeply embedded within the daily lives of Kanyakumari fishers. In contrast to Chatterjee’s assertion, villagers engage daily with the state through “routinized, legalistic and plural associations” (p. 139). The institutions introduced by the Indian state to address the needs of subaltern classes have been remade by these same classes as a result of their own assertiveness within them and the new claims made through them on their own behalf. Chapter 4 brings these realities to bear on the institutions of the Catholic Church, which Sundar describes as “an institution of singular importance” in the region (p. 141). The chapter charts how, over five centuries, the church has become the “quasi-state” of today and explores the church’s role in helping to shape contemporary civil society. In describing the role of the clergy in shaping public institutions, Sundar draws on Gramscian typologies of the “intellectual,” arguing that priests in the region work as both “organic” and “traditional” intellectuals articulating the aspirational class-consciousness of the local fishers while at the same time reifying the institutional sensibilities and hierarchy of the Catholic Church. By characterizing the identity of the Church and its members as “fluid and often tactical in nature” (p. 174), Sundar highlights the difficulty in taking as granted an Indian society characterized by unchanging, ascriptive communities, maintaining instead that even communities based on religious identity are capable of multiple and conflicting sets of interests. Chapters 5, 6, and 7 are the heart of Sundar’s dissertation, each taking in turn a set of associations – village governance, economic empowerment, and vocational – in order to explore the ways in which villages act to challenge, adapt to, or counter existing hierarchies of governance and market pressures. Chapter 5 deals with organizations of self-governance –Basic Christian Communities, parish councils, youth groups – that have been established by the Church but have nevertheless become sites of contestation over collective identities of village, Church, and community. Sundar uses interviews and meeting transcripts to show that, while traditional village committees still resist the intervention of the Church, they have begun to face challenges from class, gender, and even individual interests. Using the same techniques, Chapter 6 examines microcredit and self-help groups set up by and for women, but unlike other studies of these organizations Sundar is not concerned with the success of such projects but rather with understanding their import for civil society and the relationships developed between association members and the economy. Chapter 7 draws the previous two chapters together to explore the ways in which fisher communities have tried to (re-)assert control over the fisheries’ resources, re-embedding moral economy into their relationship with global markets. Drawing from district police records to tease out how various conflicts have arisen over the commons, Sundar shows that ultimately the market has worked to dis-embed notions of community from notions of the commons. Fisheries husbandry alone is no longer a necessary and sufficient good for the health of community. The people of Kanyakumari relate to the state in complex ways. They are not just subaltern subjects cared for by distant institutions but rather utilize the institutions provided to them by the state to contest its very legitimacy and to make new claims on their own behalf. While not the model of civil society that arose in Europe, Sundar nevertheless demonstrates that civil society can arise among the subaltern. University of Toronto. 2010. xiv + 344 pp. Primary Advisor: Jonathan Barker. To contribute a review of your own, to have your dissertation reviewed, or to contribute a Talking Shop or Fresh from the Archives piece, all you need to do is get in touch.